At least it was here for a few hours on Friday when the sun was shining and temperatures soared up to 60F/16C. Never mind that it has gone back down to freezing temperatures today or that it could even snow again this season, it felt like winter had finally gone away. When a friend called and asked if I wanted to go for walk in the forest preserve and look for early migrants, I thought great idea, no more ice and the temperature is mild. Other than a few flooded paths, it was a great day and turned into a five-hour, four mile hike. One of the best things about early spring birding besides a wide variety of migrant birds passing through the area is the lack of leaves on the trees. It is much easier to find a bird when it can’t hide in the foliage. You can also clearly see all the old nests. This looks like a hawk’s nest, probably a Cooper’s Hawk but it could be another kind of hawk. Hawks will often reuse and rebuild a previous year’s nest and if abandoned, it could be taken over by an owl. Great Horned Owls do not build their own nest and will take over old nests from other species. This nest was at eye level. It is one of the biggest and most intact hornet’s nests I’ve ever come across. I would have loved to see the inside of it! 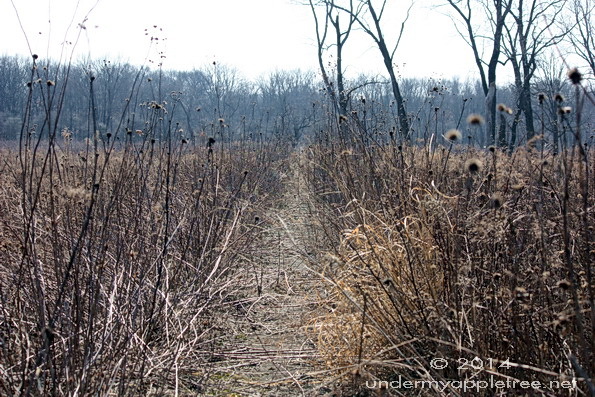 One of the areas we walked is the Wolf Road Prairie, a native Illinois prairie that has (miraculously) survived to the present day without ever being plowed or developed. At one time it was considered too wet and when development was scheduled in the late 1920s, the project failed during the depression and the land lay vacant for decades. In the 1970s the Save the Prairie Society was formed to prevent any future development on the land. Today it is a nature preserve. 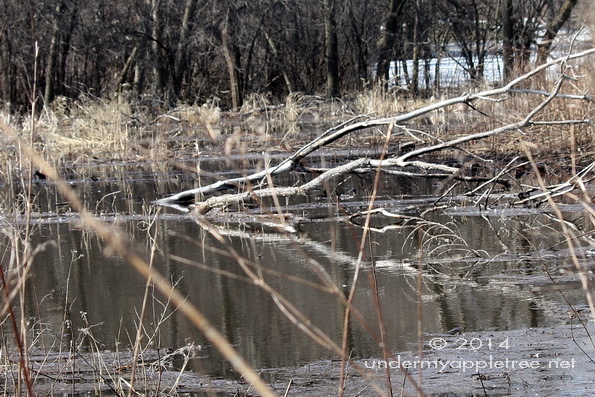 Parts of the prairie are wetlands so there was some flooding and impassable paths. The wildlife and birds were not very receptive to having their photos taken. We saw some beautiful Wood Ducks and Blue-winged Teals which immediately took off in flight before we could get near them. There are no paved paths and lots of fallen trees, thorny vines, and loads of insects in the summer, so not a lot of people walk in this area and birds were wary of us. A bird I don’t see very often is the Northern Shrike. This bird winters in the northern US and heads back to Canada for the breeding season. Central Illinois is the far southern end of their winter range. They are unique in that they are a predatory songbird and feed on small birds and mammals. I have seen them carrying off mice and once, a goldfinch. 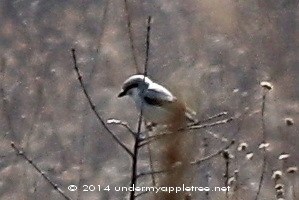 The Shrike was out of good camera range even with my zoom lens, but I took a photo anyway just for the record. For a clear image of a Shrike, there are some nice photos here, at All About Birds. How wonderful to have spring-like weather and seeing all the birds coming out. But that’s not for us, a cold week ahead and this morning at -14C (6.8F). I was told that migration has already started (?) I just wonder how the migratory birds know when’s a good time to fly up north here from the south, not knowing our local temperatures. It’s back to cold again today and for the coming week, but it was soooo nice to be out in warm weather yesterday. Migration has started here but it will be a few more weeks before the smaller songbirds show up. Some species migrate based on daylight. I don’t think cold temperatures are a problem as long as they can find food. I’m seeing flocks of Robins returning to the forest preserves but not yet in the backyards. Yesterday we counted 400+ Sandhill Cranes heading your way and lots of Canada Geese. Also, Red-wing Blackbirds have made an appearance at the marsh although not in large numbers yet. I had plans to walk around the neighborhood and capture the trees that are boasting new blossoms, but my allergies kept me indoors most of the week. Maybe later….I love your nature walks. Allergies – one more reason why it is much nicer to walk in the woods before the leaves and pollen show up. Terrific photos, Leslie. That hornet’s nest is shockingly huge. We have some sun here today and the air smells like spring … finally! I was really enjoying that fresh air. Now I understand why dogs turn their heads into the breeze and just breathe! What a beautiful area for walking–soggy or not! I think the lack of color in these photos makes them beautiful. The texture of the branches and nests really stands out, as do the grasses. Sounds like you had a lovely day. The warm weather made the lack of color ok, and even though that area is surrounded by suburbia, it felt like a day in the country. There are almost no original prairies left. This one is the largest and best quality prairies east of the Mississippi. There are a lot of areas that are being restored but I’m told it is not the same. There are a lot of rare plants in this prairie that are missing in restored areas. That hornet’s nest is something else! Sounds like you had a wonderful walk and a touch of spring, Leslie. What a great place to walk! You got some great photos too! I would have steered clear of that hornet’s nest!! that was a great walk. 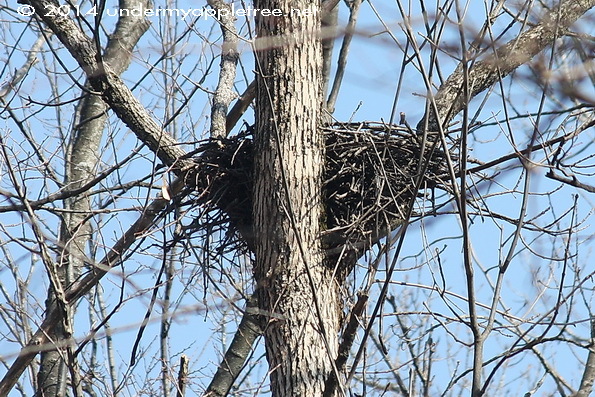 Love that you can see the nests without the leaves. 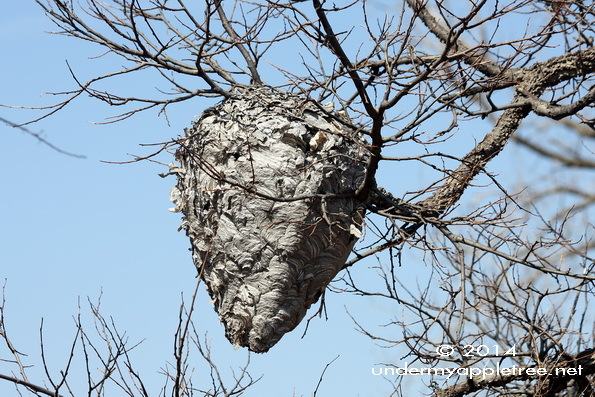 And that hornets nest would have been neat to see inside. I did not realize that word would eat mice and other birds. Will winter ever end? Still chilly and windy here (30s). That hornet’s nest is massive. Didn’t know that about Shrikes (eating smaller birds)! I saw a wasp’s nest on the ground yesterday while on my walk. Must have blown out of a tree. Is your snow gone? It is up here except for a few piles that decreased a good deal over the weekend. The only good thing about spring snow is that it tends to melt soon after. Lets hope that’ll be the case this week! I knew the Shrikes ate mice but I didn’t know about other birds until I saw one fly past me carrying a goldfinch in it’s claws. The Shrike is only about the size of a Robin so it was kind of creepy to see that. Most of our snow is gone, just a few dirty piles mostly in parking lots. But now I hear more snow is predicted for Tuesday. At this rate I will never get my garden cleaned up and planted. How nice that a piece of prairie has survived. And I’m glad the snow and ice is gone. We had none this year, but still we’re very happy to enjoy the warmer weather. Also around 16C with (much) lower temps at night. This has been a record-breaking snowy year for us. Only once before has there been this much snow and it was back in the 1970s. So lucky me, I got to live through that one too! Lovely series! I got out for a little bit this weekend too, but not as much as I would have liked. I know what you mean about the bare trees, I hope you find many more uncommon birds in the next few weeks Leslie. That shrike is a very attractive bird.